Would it surprise you that in a recent FlexJobs survey working parents rated work flexibility higher than salary? The survey asked almost 1,200 working parents who had children under the age of 18 what they felt about work, work/life balance and work flexibility. Sara Sutton Fell, CEO of FlexJobs, gave us the scoop on their latest survey results. Sara said the survey’s results were profound and say loud and clear that working parents value work flexibility. In the past, she said, we’d believe that time is money, but now we see that our time is worth more than just money. That’s not to downplay the crucial need to bring home a good paycheck. “The survey results aren’t about money versus work flexibility. I believe that working parents have a financial baseline that is acceptable for their family and that once that level of security is reached work flexibility can become more important than salary. When you are at that baseline and you feel financially secure then you have choices.” said Sara. Sara said in some ways work flexibility can help you get to that secure financial baseline. Work flexibility may help you do your job better and a result of that could come in a monetary form like a promotion or a raise. Work flexibility can be the key to financial security for some working parents. Work flexibility appeals to highly educated and experienced workers. 73 percent of respondents have a college or graduate degree and 31 percent are manager level or higher. Other important factors for working include wanting to pay for basic necessities (80 percent), pay off debt (61 percent), have a professional impact in the world (41 percent), contribute to charity (28 percent), pay for child-related costs (27 percent), pay for kids’ education (27 percent), and pay for continuing education for themselves (25 percent). The majority of women in this survey report “needing” to work, but 66 percent-- two out of three --also report “wanting” to work. "When you become a working parent you have so few choices. 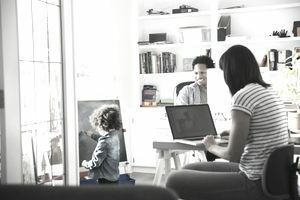 You can either continue to work on your career path or leave to become a stay at home parent because the financial equation of childcare costs didn’t work out. I love the concept of work flexibility. It adds weight to earning money and caring for your kids. Work flexibility gives you the option to better manage work and family life.” said Sara. Sara knows first-hand that teachers are bummed out that parents are missing out on school activities because of long work hours or work commitments. If schools got a healthy percentage of parents involved it would help the community, the children, and then trickle out into the system. Work-life balance (80 percent), family (53 percent), time savings (48 percent) & commute stress (48 percent) are the top four reported reasons women seek flexible work. Sara sees these surveys as an educational candidate tool for companies. Before the recession, stay-at-home moms who wanted to re-enter the workforce were the most underemployed, untapped, difficult to find talent pool. These surveys and their job board show employers that these are highly developed candidates like these that are willing to work but need work flexibility. Let’s not forget the practical reasons like suffering from fewer interruptions which is why workers are more productive. “A statistic that gets a lot of attention is that 93% of workers in our survey say they would not go to the office to be most productive! This is a really loud warning sign and companies are missing out on huge opportunities by not offering work flexibility.” said Sara.